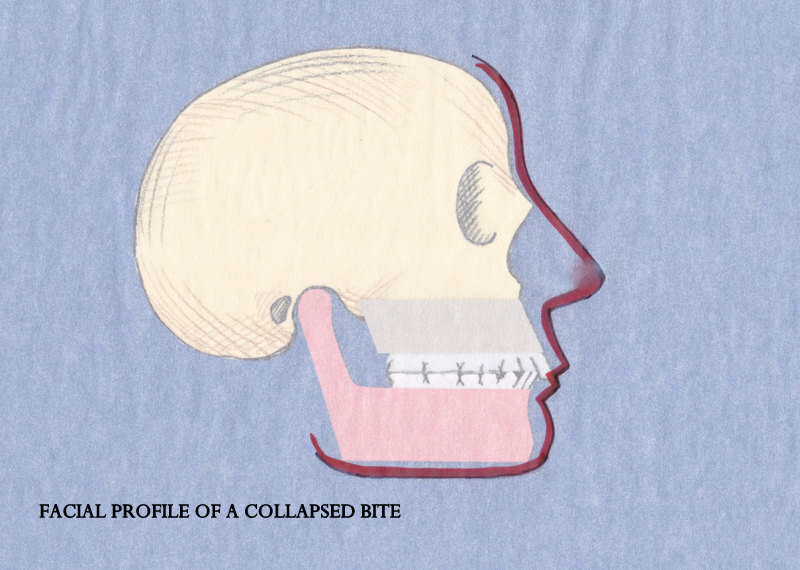 The lower jaw (pink) is a double-hinged bone that is suspended between two joints. Its distance from the skull is technically determined by the height of the teeth, just like columns holding up a roof. The “columns” are high, the jaw-joint is healthy and the tongue has room to fit inside the mouth. The esthetically pleasing profile usually reflects the healthy jaw and teeth with full lip support, and a forward positioned mouth. The face reflects harmony. The teeth are worn down (the columns are shortened) and the jaw has approached the skull. 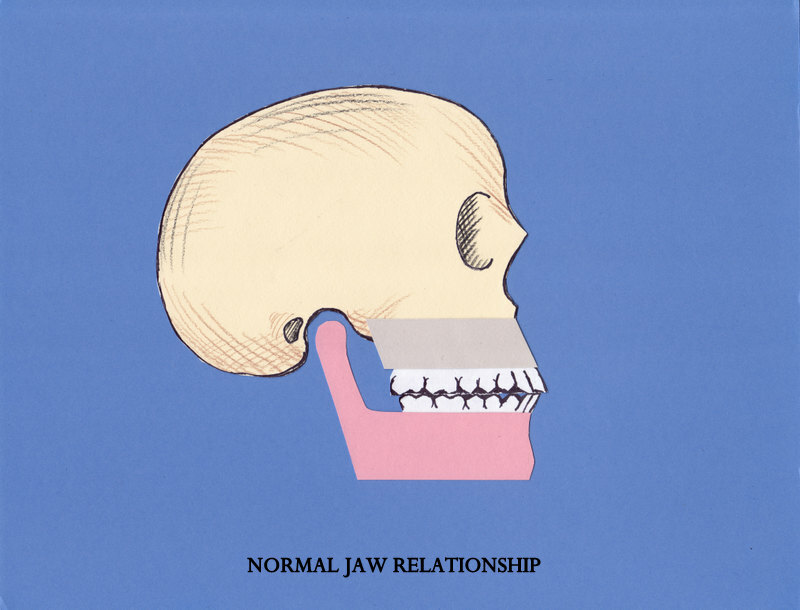 The TMJ (jaw-joint) is under strain and the lips have collapsed inwards. 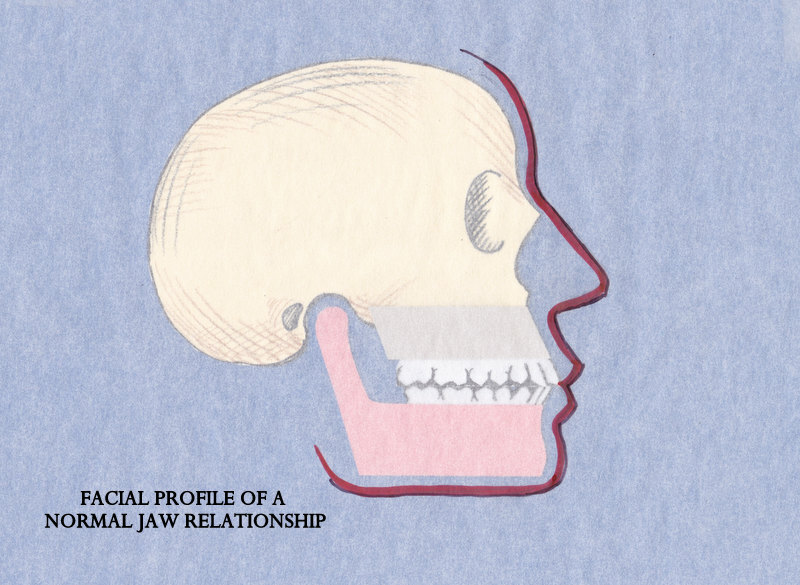 The Jaw-joint has been jammed deeper and backwards into the skull. The delicate disc is usually popping in and out of place every time the mouth opens and closes, creating that characteristic “click”. An orthotic that fits over the lower teeth will allow the jaw to vertically reposition itself and function in a physiologically corrected position. It takes at least 3 months for the jaw-joint and the muscles to adapt to this position. During this phase certain symptoms such as muscle spasms, tenderness, and headaches will generally improve. As symptoms improve, and the patient is comfortable functioning in the open position, the bite is restored to the new vertical dimension. The orthotic is sequentially cut back and the teeth built up with onlays or overlays. Eventually all the teeth are restored and the orthotic is discontinued. The jaw-joint is in a physiologically corrected position and the teeth have been restored to full anatomy. This entry was posted in Jaw Orthopedics by Admin. Bookmark the permalink.